We should always use clean makeup brushes because dirty brushes attract dust, bacteria, and sebum. It can cause breakouts, scratching and skin irritation. We should give makeup brushes a deep cleaning time to time. One of the more annoying parts of cleaning your makeup brushes is waiting for them to dry out afterward. Today I am going to discuss this topic. I wanted something which can do this task fast and an efficient way. I found this an amazing tool which can clean makeup brushes very quickly and effectively. This electric brush cleaner can do both the washing and drying. Specifically, it comes with a small motorized spinner (batteries included), eight different size silicone cover to stick your brush handles into a bowl. I purchased mine here at first I thought it was pricey but then my sister has it and she swears by it so I had to get one. This device cleans and dries makeup brushes very quickly and efficiently. We can avoid wasting a lot of time in the sink cleaning and then wait for your brushes to dry. variety of cover sizes for different brushes. To clean your brush, first, we need to pick the right cover to fit the handle of the dirty makeup brush. Then put some water and brush cleaner solution or mild shampoo to the bowl. Switched on the cleaner and dip the brush-up and down in the solution for a few seconds, spin the brush in the water for 10 to 20 seconds. Rotating the bush fast enough that the bristles flare out almost like fan propellers too. Then take the brush out of the water but keep it in the bowl and allow it to spin the brush in midair for a further 10 seconds to dry. 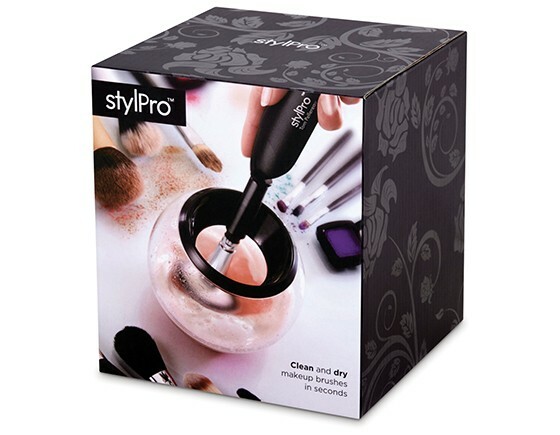 I hope you liked this product as I personally loved how it made cleaning my brushes an easy process. I need this in my life! I’ve been cleaning my brushes either with shampoo by hand or with the beauty blender cleaner. Both are a pain and I feel like they’re hard on my brushes. Gonna look into this! I highly recommend you to get it and the best part is you can you use it right away. Like if you’re applying a dark eyeshadow with your blending brush and don’t want to get smudgy eye you can totally use right after using this amazing tool!